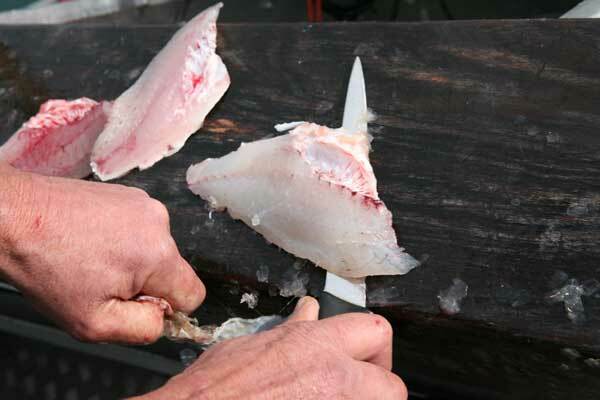 After you fillet a fish the next step is skinning the filet. Our guys prefer to use a Victorinox skinning knife. It is longer, and more pointed, than the one he used to filet the fish. 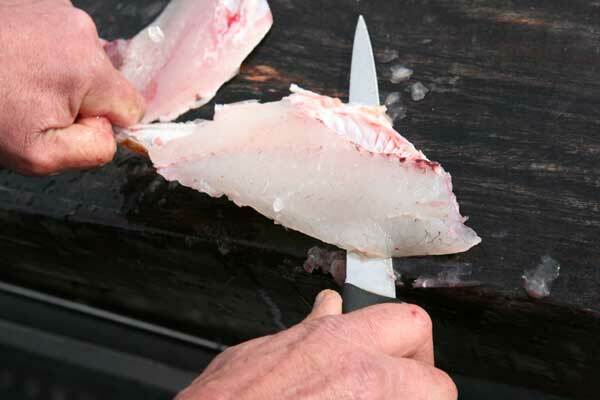 Many fishers have trouble removing fish skins in one peice. This is because any changes to the angle of the knife can perforate the skin. 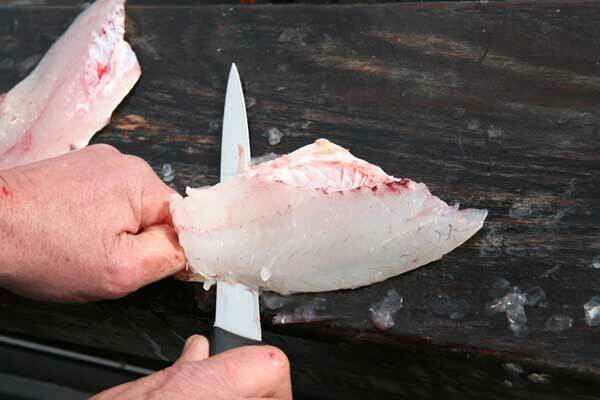 The technique shown is to hold the knife still and move the fillet over the blade. This results in much more control over the angle of the knife and much less chance of cutting through the fish skin or messing up the fillet. 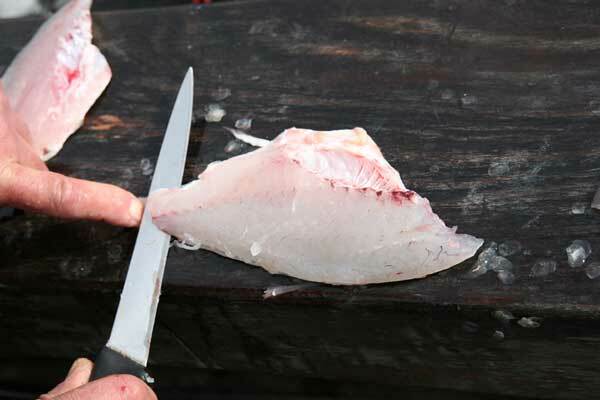 First lay the fillet skin side down and carefully cut between the fillet and fish skin while holding the knife at a shallow angle. This is the only cut where the knife is moved back and forth. 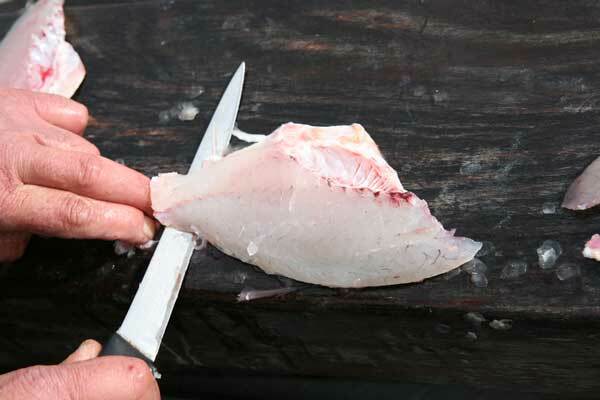 Cleaning Fish Tips : When filleting or skinning fish keep the skinning knife clean and wet, this lubricates the blade and gives a much cleaner cut, more control of the knife and far less drag on the sides of the blade. Stop when you have an inch or two (25 to 50mm) of fillet released. Firmly hold the knife still and at a fixed angle. Continue this motion through the fillet. 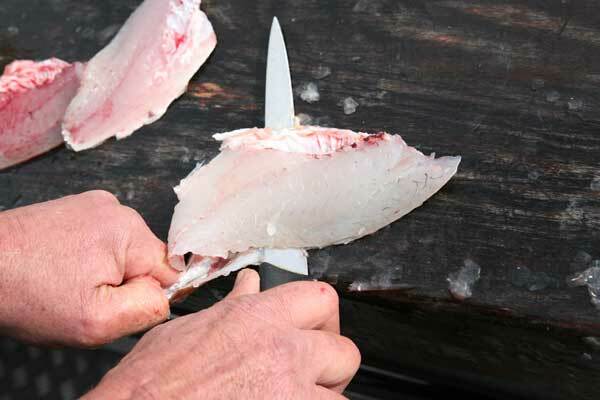 You can see that even though the skin in the left hand is creased under the tension it has no effect where the filet knife is separating the fish skin from the flesh.